An instant personal loan is among one of the easiest finance options. All your dreams can be fulfilled by taking an Instant personal loan. You can use a personal loan for any requirement such as higher education, medical expenses, family holiday, job loss, wedding expense, unfavorable event etc. A personal loan is also known as an unsecured loan. No collateral is required to avail the personal loan. As it is unsecured loan it is offered at higher interest rates. An instant personal loan is very popular as it is easy to avail and comes with fewer restrictions. Indian Income Tax Act allows various tax exemptions and deduction on interest payment for loan such as home loan, education loan etc. In case of personal loan tax deduction or exemption are allowed in certain conditions. In this post, we will be discussing personal loan tax benefit conditions. The personal Loan amount is not taxable. This means that the loan amount given to you by bank or NBFC is not considered as a part of your income when you are filing income tax returns. You need not to pay any income tax on the personal loan amount. However, the loan should be taken from valid sources such as a bank, financial institution. A loan taken from relative might be considered a part of your income. 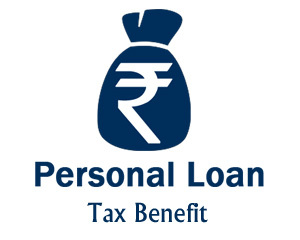 Personal Loan also comes with tax benefits provided it is used of a specific purpose. Only interest payment is allowed for the income tax deduction. The conditions under which deduction is allowed are given below. If the personal loan amount is used for the business expansion or business purpose, the borrower can avail tax benefits on the interest paid. The amount paid as an interest component in the loan can be deducted from the profit before calculating the tax liability. This deduction will reduce the next taxable profit of the business and thus reducing tax liability. No maximum limit is applicable for the interest amount which can be claimed for a tax deduction. If you use a personal loan for construction or purchase or real estate property you can avail tax deduction under section 24. The maximum amount allowed under this case would be 2 Lakh for self-occupied property. In order to claim this deduction, you need to submit a certificate which is issued from the borrower’s bank which certifies that amount taken as a loan is used for purchase/construction of real estate property. 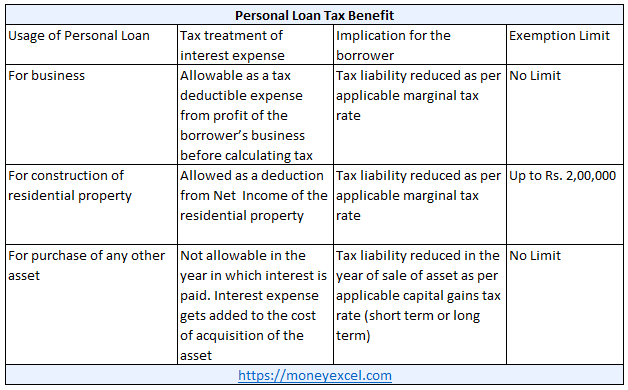 If you use a personal loan for the purchase of any other assets such as shares, jewellery, non-residential property you can not directly avail tax benefits on interest paid. However, Interest expenses get added to the cost of purchase of an asset. Whenever these assets are sold you can get an advantage of capital gains. This means your tax liability will be reduced in the year of sale of the asset. Few important points to consider while taking personal loan are given below. The amount received from Personal Loan is not taxable in nature. You need not to consider this amount as your income while calculating income tax. Only interest amount of payment can be claimed for tax deduction under various conditions mentioned above. You cannot claim the principal component for the tax deduction. You are required to submit necessary proof to income tax authority about the usage of personal loan. You can avail such certificate from the bank or from auditors. If you want to claim ax benefit on a personal loan, you are required to keep a copy of all important documents such as sanction letter, expense statement, auditor’s report etc.